Last November, for Scott's thirtieth birthday, we added a new plant to Scott's Memorial Garden in our backyard. When we went to the local nursery to make our selection, one of the things we wanted to be certain of was the hardiness of the plant. Would it withstand the drop in temperatures as fall and winter settle into our valley? We chose a Camellia Sasanqua with semi-double white flowers and ever-so-slight pink edges. It made a lovely addition in the corner of the garden. It is November again. 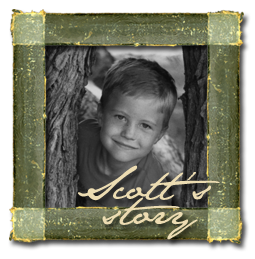 Scott's birthday is just a few days away. And fall has finally arrived over night with a wonderful gift of rain. I walked out into the garden this morning to see how the various plants had survived the downpour. There in the corner of the garden was Scott's birthday bush ~ covered with blooms, and many buds waiting to open! Little did I realize that this hardy plant was going to bloom each November (as I am really just a poser when it comes to gardening). What a wonderful surprise to know that every year on Scott's birthday we will have a display of flowers to say how very much Scott is loved and missed by us all. What a beautiful image as the chill of winter settles in that we have a blessed hope of a glorious reunion.